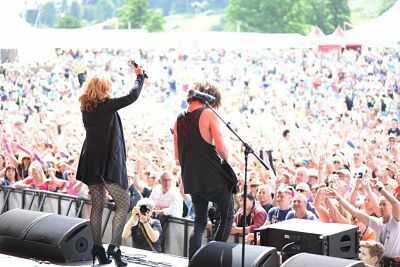 Make your event unforgettable, book T’Pau to perform at your event – we are a booking agent for T’Pau, and can arrange for them to perform for your guests. T’Pau burst onto the music scene in 1987 with the hit “Heart & Soul” reaching No. 4 in both the UK & US charts. Taken from the debut album “Bridge Of Spies,” it’s innovative use of a rap verse by a white female vocalist introduced the world to the distinctive lead vocals of Carol Decker & the song writing talents of Carol & Ronnie Rogers. “Heart & Soul” led to a meteoric rise in T’pau’s fortunes both at home & in the USA, where the track stayed on the US billboard chart for 6 months. After a UK arena tour supporting Bryan Adams, the band immediately toured UK City Halls as headliners to tie in with the next single, the classic ballad “China In Your Hand.” Nobody could have predicted the enormous impact of “China” which stayed at No. 1 for 5 weeks – the longest serving No. 1 of the year! simultaneously Bridge Of Spies occupied the number1 album slot for 2 weeks The Arena concerts followed. The original line up of T’pau split in 1991 after the final hit “Whenever You Need Me”. By 1997, Carol had taken the decision to build a new T’pau around her, and get back on the road after assembling a massive amount of new material. A 25-date UK tour in the summer of ‘97, including some festivals, preceded the release of a brand new version of “Heart & Soul” on the band’s own Gnatfish label. Encouraged by the response, Carol embarked upon recording ‘Red’ the first new T’pau album for 6 years. After 6 months in the studio, T’pau performed an orchestrated version of “China” with the BBC Concert Orchestra at the Princess Diana Tribute Concert at Althorp in June 1998. It was broadcast live around the world, and later in a BBC primetime show. All this no mean feat as Carol had been pregnant throughout the recording of the album and gave birth to her first child, Scarlett Olivia, just 3 weeks before the Diana concert! Business as usual as T’pau quickly joined Status Quo on the European Tour. In 2004 Carol appeared in the West End cast Of ‘Mum’s the Word’ at The Albery Theatre with Patsy Palmer, Imogen Stubbs & Jennie Éclair. Other acting opportunities offered were’ Doctor’s’ for BBC One, ’Star’ with Nicolas Hoult for Children’s BBC, UK films,’Nine Dead Gay Guys’with Steven Berkoff, Fish & Michael Praed. ’Running Time, the first UK Interactive Film. Carol also addressed The Oxford Union in 1995, speaking on Women In The Music Business. TV appearances include Never Mind The Buzzcocks, Trigger Happy TV, Hit Me Baby One More Time, Just The Two of Us & The Mathew Wright Show,Loose Women, Lorraine. Carol has always been a regular & popular guest on radio, including Ken Bruce & Steve Wright for Radio 2,Mark Goodier & Paul Coia at Smooth Radio. Carol has presented shows for Absolute 80’s, Magic, LBC & BBC Radio Berks. Carol continues to perform live in concert regularly to huge crowds in the UK & abroad. After embarking on the hugely successful #Tpau25live anniversary tour in 2013 Carol and Ronnie went back into the studio and wrote and recorded Pleasure and Pain released in 2015 to 5 star reviews. They also went on the sellout Songs and Stories acoustic tour, where Carol and the band were promoting her autobiography Heart and Soul. Contraband is the UK’s top booking agent, with affable, experienced account managers who guarantee you the best deal possible. 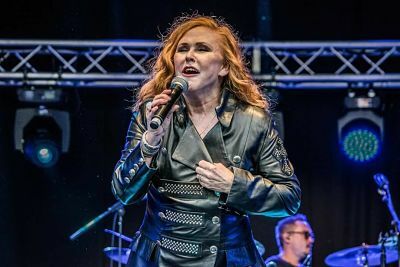 Contact us today if you would like to book T’Pau to be the headline of your event! We as your booking agent are more than happy to help you create the most memorable moments with T’Pau.